MUNICH–(BUSINESS WIRE)–Late-breaking data published and presented today confirm that the non-invasive HeartFlow® FFRct Analysis enables physicians to effectively differentiate patients in need of coronary stenting or bypass surgery from those who can be managed with medications alone. The ADVANCE Registry was published in the European Heart Journal (EHJ) and the Aarhus University Hospital experience was published in the Journal of the American College of Cardiology (JACC). Both studies were presented during the late-breaking science session today at the European Society of Cardiology (ESC) conference. In these studies, the HeartFlow Analysis changed physician management of patients and enabled physicians to determine more efficiently which patients required invasive management and which did not. The HeartFlow Analysis identified a set of patients at very low risk of adverse outcomes when undergoing medical therapy, and a set whose risk was reduced when undergoing invasive management. The ADVANCE Registry included more than 5,000 patients in the U.S., Japan, Europe and Canada. The Aarhus University Hospital experience included more than 3,600 patients in Denmark who were followed for an average of two years. “These studies confirm the role of the HeartFlow Analysis in identifying disease that other tests may miss, and in providing reassurance to patients and doctors that some blockages are not in need of invasive management,” said Campbell Rogers, MD, FACC, chief medical officer, HeartFlow. The HeartFlow Analysis provides FFRct values along the coronary arteries, helping physicians to assess the impact of a blockage on blood flow. A positive FFRct value ( ≤0.80) indicates that a coronary blockage is impeding blood flow to the heart muscle. 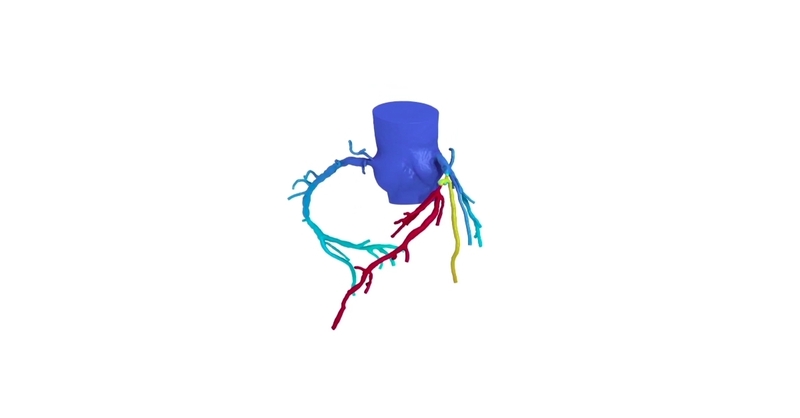 In both studies, patients underwent a coronary computed tomography angiogram (CTA), and when additional information was needed, a HeartFlow Analysis 3D digital model was then used to help determine optimal management. In the ADVANCE Registry, the added information contained in the HeartFlow Analysis led physicians to reconsider and change management plans for two-thirds of their patients. Some who were originally scheduled to receive a coronary stent or bypass operation were safely able to avoid the procedure and be treated with medications alone, while others who would have received medications were redirected to stenting or bypass surgery. In the Aarhus University Hospital experience, physicians were able confidently and safely to differentiate higher risk patients who required additional testing, stenting or bypass surgery from patients whose treatment required only medications. In both studies, coronary narrowings associated with negative FFRct values ( >0.80) were predominantly managed with medications alone and were associated with excellent outcomes, similar to those outcomes in patients who had no or minimal narrowings. In both studies, the HeartFlow Analysis helped physicians identify patients who could be treated safely without invasive testing or treatment. In the ADVANCE Registry, among more than 1,500 patients with a negative FFRct value, the vast majority received medical therapy without invasive testing or treatment, and none experienced adverse events. In contrast, when the HeartFlow Analysis showed a positive FFRct value, it helped physicians identify patients who were at higher risk for death, heart attack or emergency stenting or bypass, and who would likely benefit from invasive management. In the Aarhus University Hospital experience, patients with a positive FFRct value who received medical therapy alone suffered heart attacks at a rate six times higher than that seen among patients who received a stent or underwent bypass surgery. In the ADVANCE study, patients with positive FFRct values were at 20-fold higher risk compared to those with negative FFRct values. Clinicians diagnosing someone with suspected coronary artery disease (CAD) want to know as definitively as possible if the individual has a significant blockage in their coronary arteries. They also want to know the impact of that blockage on blood flow so they can best determine which treatment pathway is appropriate (e.g., medical management, stenting or coronary artery bypass grafting). Data from a patient’s non-invasive coronary CTA are securely uploaded from the hospital’s system to HeartFlow’s software application running in the AWS cloud. HeartFlow leverages deep learning to create a personalized, digital 3D model of the patient’s coronary arteries. The HeartFlow Analysis then uses powerful computer algorithms to solve millions of complex equations to simulate blood flow and assess the impact of blockages on coronary blood flow. The HeartFlow Analysis is provided via a secure online interface to offer actionable information to enable clinicians to determine the optimal course of treatment. To date, clinicians around the world have used the HeartFlow Analysis for more than 20,000 patients to aid in the diagnosis of heart disease. 3 Douglas PS, DeBruyne B, Pontone G., Patel MR, et al. One-year outcomes of FFRct-guided care in patients with suspected coronary disease: The PLATFORM Study. J Am Coll Cardiol. 2016;68(5),435-45.